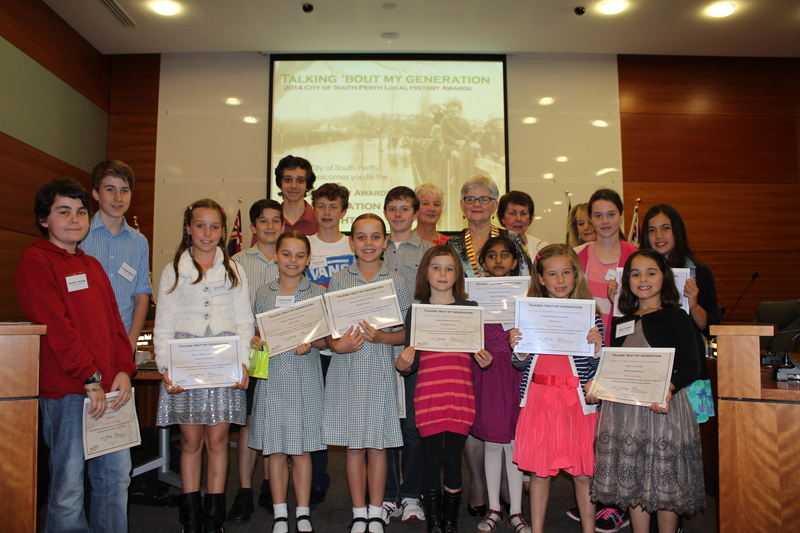 Last night, 18 excited winners and their families joined us at the City of South Perth Council Chambers for the Presentation Ceremony for the City of South Perth’s 2014 Local History Awards, Talking ’bout my Generation. Mayor Sue Doherty presented each of our winners with their certificates and prizes while families, friends, school representatives, Councillors and our panel of judges watched and applauded. Copies of the Award Winners Collections for 2012 and 2014 are also available for loan at the South Perth and Manning Libraries. A big thank you to all our entrants for sharing their memories and stories of the City of South Perth and for engaging with South Perth’s local history. We look forward to running a joint local history award with the Town of Victoria Park in 2016! For more details about the City of South Perth Local History Awards, please visit the South Perth Library Website – Local History Awards.